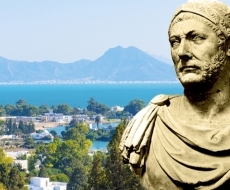 Tunis, Carthage, Sidi Bou Saïd are places loaded with history but also overflowing with life. The capital offers you restaurants, shows, monuments, historical neighbourhoods… and even beaches, golf courses and trendy nightclubs just a few kilometres away! Lose yourself in the alleyways of the medina, drink a mint tea on the rooftops or go shopping in the beautiful covered souks. 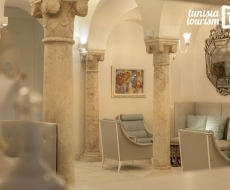 Then dive into the Tunis of 1900 around Avenue Bourguiba. Enjoy grilled fish in the central market, or in a restaurant in La Goulette, on the coast. Climb to the top of the hill in the charming village of Sidi Bou Saïd: a unique panorama across a turquoise sea! Depending on your mood, you could enjoy an evening flavoured with Andalusian music while tasting delicious tiny pastries, or you could dance until the sun comes up in one of the famous nightclubs of the Coasts of Carthage. In summer, swimming and sunbathing are the order of the day on the beaches just a few kilometres away from the city centre. Golf, wind-surfing, jet ski, exotic massages in a spa or camel-rides… the Coasts of Carthage seaside destination has plenty to keep you entertained. And if you wish to get a better understanding of Tunisian culture, you could visit an ancient palace or an art gallery, attend a contemporary dance performance or a concert of Sufi musicians. For a typical Tunisian meal, head for something like Chez Slah in the city centre, Fondouk al-Attarine in the medina or Lemdina in the Berges du Lac neighbourhood. Nightlife: many trendy cafés and restaurants in Berges du Lac, seaside bars and nightclubs in Gammarth. Shows: whether you are interested in traditional Arabic music, dance or Tunisian cinema, you will find all kinds of events in Tunis, Sidi Bou Saïd, Carthage and La Marsa. Video: Inauguration of the City of Culture. Visit an opulent Oriental palace in Sidi Bou Saïd: Ennejma Ezzahra, built at the beginning of the 20th century by an admirer of Tunisian culture, Baron Rodolphe d’Erlanger. Magnificent park and musical instruments museum. The Great Mosque Al-Zaytuna, the ruins of Carthage, the Bardo Museum, the medina, the village of Sidi Bou Saïd… the capital and its surroundings deserve a long visit. 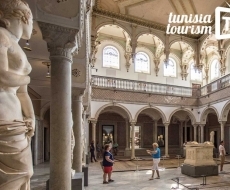 Recently modernised and expanded, this famous museum contains a vast collection which covers the entire history of Tunisia, and more specifically its ancient history. You will be stunned by the prodigious collection of Roman mosaics, all whilst admiring the Arab-Andalusian decor: it is housed in a former palace. Video: Visit the Bardo Museum! Criss-crossing the modern city is required to see all the traces of the glorious ancient metropolis: Baths of Antoninus, the Hannibal district, the Magon district, Tophet, Roman Villas, theatre, cisterns of Maalga… Founded by the Phoenicians, Carthage was destroyed then rebuilt by the Romans who made of it one of the greatest capitals of their provinces, with monuments of a disproportionate size. Carthage has been declared a World Heritage Site by UNESCO. The old city of Tunis is one of the oldest and best preserved of the Arab world. It is a tangle of narrow streets lined with white walls and vault-covered shopping streets - the souks. The superbly decorated doors, the mosques inlaid with black and white marble, the shops displaying shimmering fabrics, the patios brightened by earthenware tiles give this city its atmosphere like no other. The Medina of Tunis has been declared a World Heritage Site by UNESCO. At the heart of the medina, the “Mosque of the Olive Tree” (Zaytuna or Zitouna) is one of the oldest mosques in the world (9th century), and the oldest Islamic university still in existence. Its prayer hall (exclusively for Muslims) is filled with antique columns. Outside, one can admire the majestic arcades of the courtyard, the domes inlaid with pink and white marble and the tall minaret of Almohad inspiration. Attached to the medina, the old "European" district of Tunis has preserved its early twentieth century facades. Several buildings illustrate great architectural diversity and in particular the vogue of the Art nouveau style: the Municipal Theater is the most remarkable example. 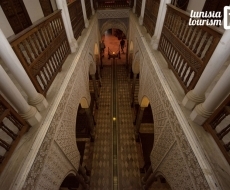 Read more: Spend time in the Tunis of 1900. At the edges of Carthage, the hilltop of Sidi Bou Saïd is an enchanting place which has inspired artists and mystics. Fishermen’s dwellings and former summer homes of the Tunis bourgeoisie create a tightly woven fabric of blue and white houses. From the summit, a view across the bay of Tunis and one of the most beautiful panoramas of the Mediterranean. Several motorways radiate outwards from Tunis and you can reach numerous points of interest just one or two hours drive away. And if you have more time at your disposal, remember that Tunisia is a small country: all itineraries are possible and the Sahara is just 450 km away. South of Tunis, this small Andalusian town perches upon a line of rocky spurs surrounded by orchards and shrubland. Ideal for a day of trekking towards the summits (Mount Zaghouan peaks at 1295 metres). Not far from there, do not miss the historical site of Oudhna and the ruins of the gigantic Roman aqueduct which transported water from the springs of Mount Zaghouan all the way to Carthage. Oudna is situated in the heart of a fertile plain in a gently undulating landscape. Its Capitol is outstanding for its spectacular two-flour vaulted basement, still existing. It was amongst the largest temples in Roman Africa. The vast and well preserved 16,000-seater amphitheatre is partly carved out of the hillside. Close to Tunis, an amazing archaeological site worth visiting! Stroll amongst the ruins burnished red by centuries of sun. Explore the palestra (Roman sports field), climb the steps of the capitol, tread the mosaic floor of the thermal baths… An educational and agreeable walk in a beautiful ancient site surrounding by lush hills. Two hours drive to the west of Tunis, this extraordinary historical site is well worth the journey. The Roman theatre and Capitol, the Numidian mausoleum, the countless ruins of temples, baths and houses form a remarkably preserved historical town. Dougga has been declared a World Heritage Site by UNESCO. This town founded by Andalusians in the 17th century contains unusual Spanish-inspired monuments. Nearby, stroll through pastoral landscapes, visit the ancient ruins of Mustis or visit the waterfall of Djebba. Habiba Msika’s house in Testour. 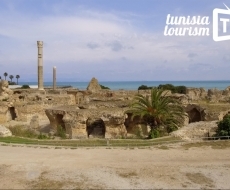 Superb beaches, pine forests, paths through wild nature and ruins of the former arsenal of Tunis… these two neighbouring locations, to the north of Tunis, are worth a visit. The Cape Bon peninsula is a charming region. Stroll through the orchards, observe the birds in the lagoons, scuba dive, visit a Carthaginian ruin or a medieval fortress, take a dip on a sandy beach or in the hot spring of Korbous that discharges into the sea… there’s so much to do! Visit the city of Bizerte. Go hiking on Mount Ichkeul which overlooks a large lake (Ichkeul National Park has been declared a World Heritage Site by UNESCO.). Take a dip on the marvellous beaches of the northern coast where creeks, cliffs, pebbles and fine sand alternate.